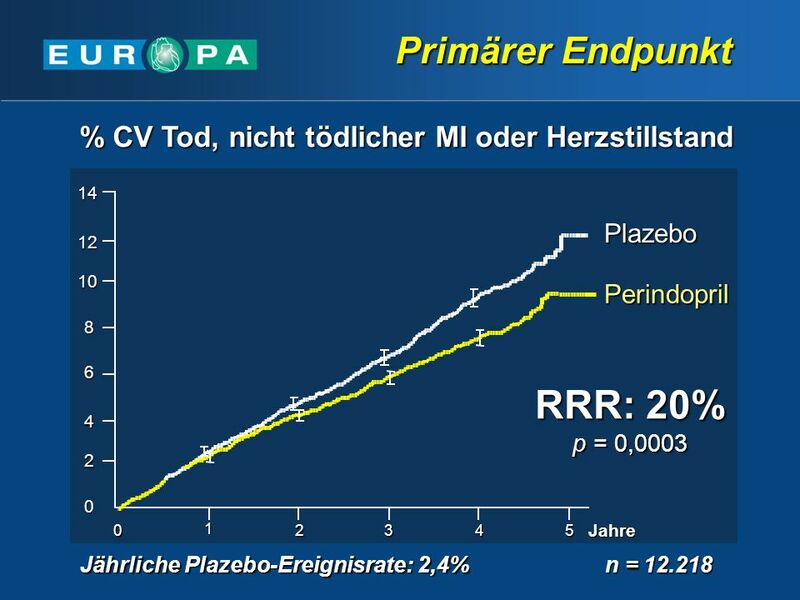 EUROPA (EUropean trial on Reduction Of cardiac events with Perindopril in stable Artery coronary disease) is the largest and longest study ever conducted. 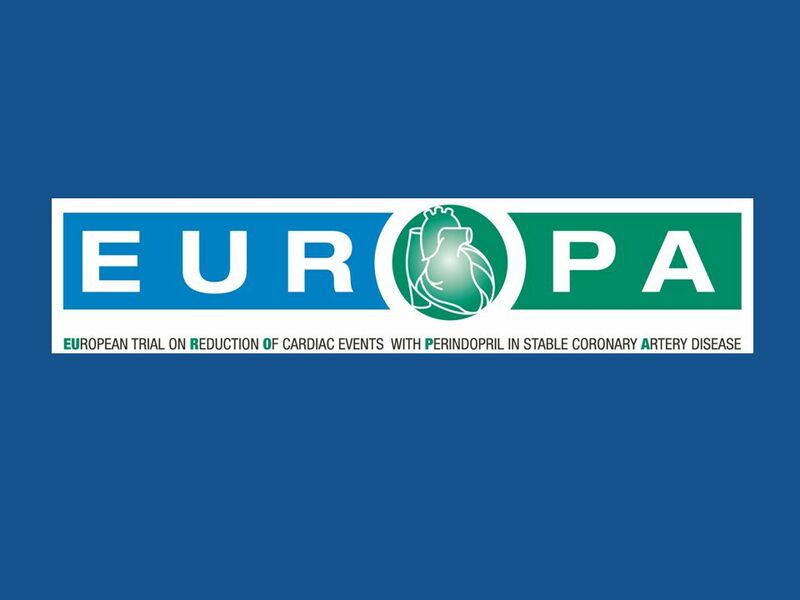 1 EUROPA (EUropean trial on Reduction Of cardiac events with Perindopril in stable Artery coronary disease) is the largest and longest study ever conducted in patients with stable coronary disease. It was announced at ESC in Vienna on the 31st of August 2003 during an official hotline session. 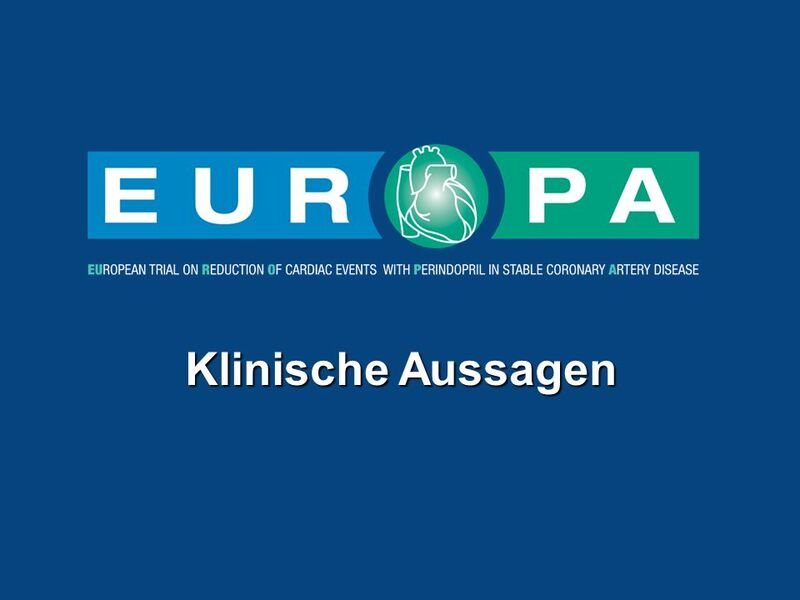 EUROPA is considered as a reference study for the initiation of the ACEI perindopril 8 mg once daily as chronic treatment in all patients with stable coronary artery disease. 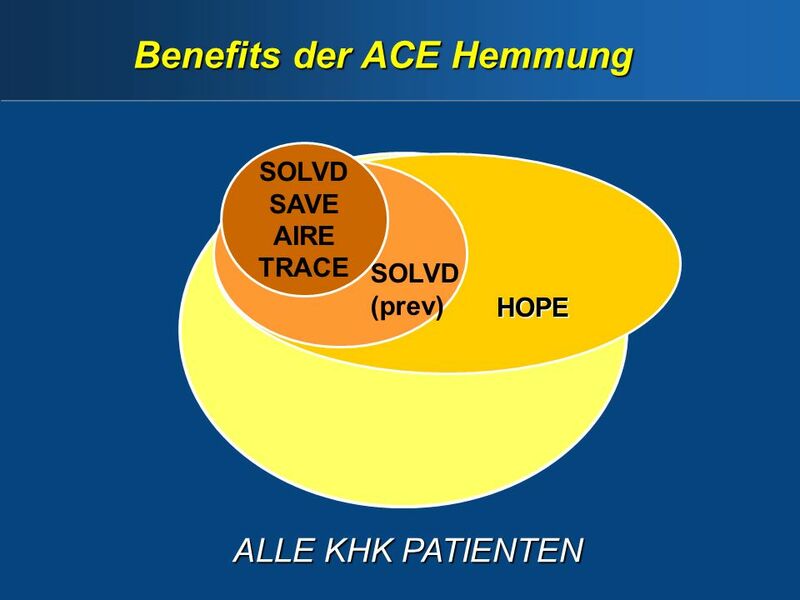 4 Sekundäre Prävention von KHK Warum ACE Hemmung? 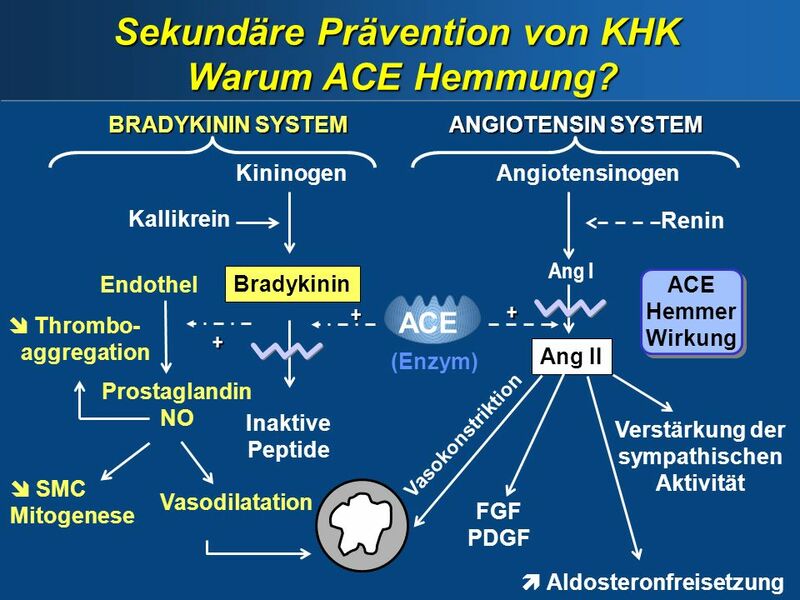 5 Sekundäre Prävention von KHK Warum ACE Hemmung? 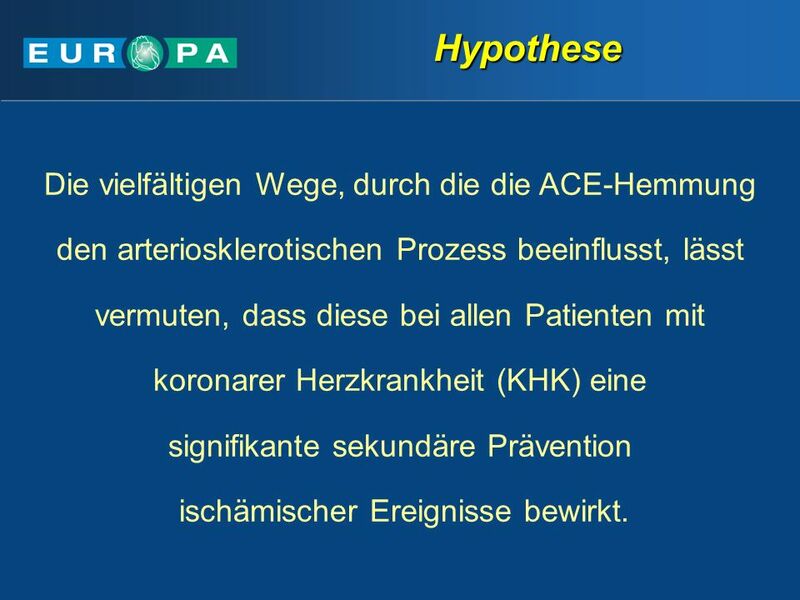 den arteriosklerotischen Prozess beeinflusst, lässt vermuten, dass diese bei allen Patienten mit koronarer Herzkrankheit (KHK) eine signifikante sekundäre Prävention ischämischer Ereignisse bewirkt. 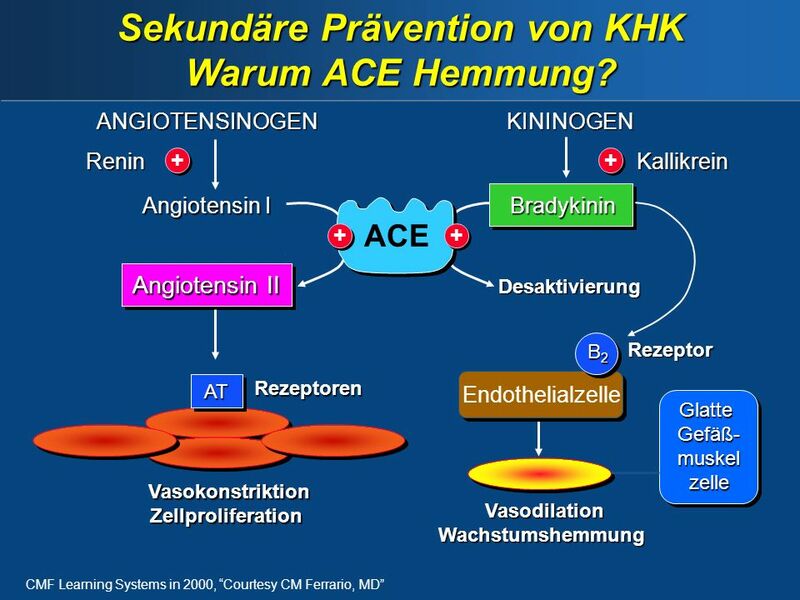 Based on the hypothesis that ACE inhibition affects atherosclerotic process in multiple ways, benefits in all patients with coronary artery disease, can be anticipated. 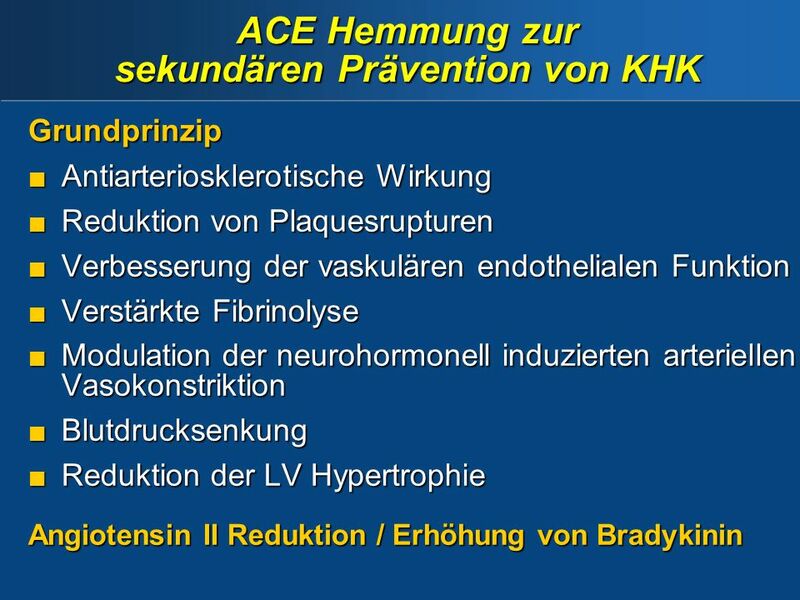 Nachgewiesene 24-Stunden Wirksamkeit Hohe Affinität zu Gewebs-ACE Spezifische Erhöhung von Bradykinin Anti-ischämische Eigenschaften: Korrektur der koronaren endothelialen Dysfunktion Normalisierung der Struktur von Widerstandsarterien Normalisierung der fibrinolytischen Balance Anti-arteriosklerotischer Effekt Anti-ischämische Wirksamkeit Gute Verträglichkeit auch bei fragilen Patienten (Herzinsuffizienz, Schlaganfall) EUROPA is investigators led study, where perindopril 8 mg once daily is the ACEI of choice due to its actions ideally suitable for investigating this hypothesis. 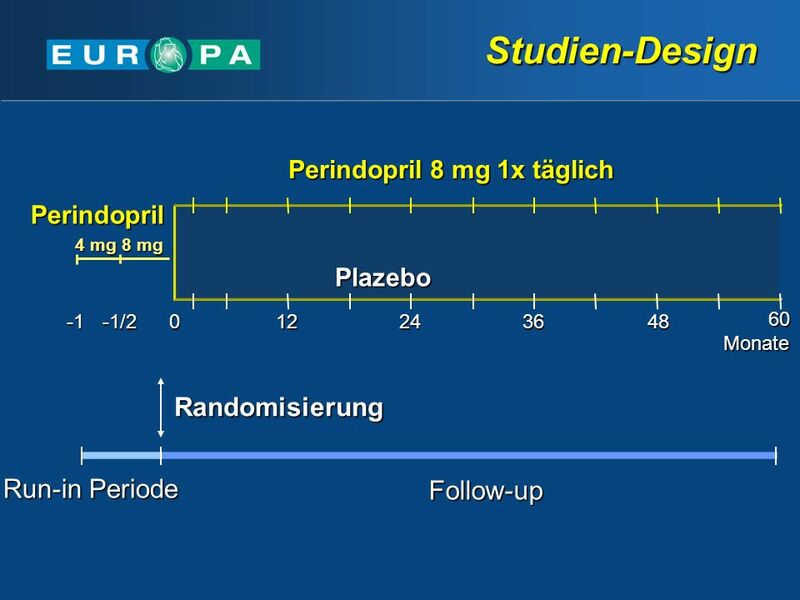 Looking more specifically at the main reasons why perindopril was chosen for the EUROPA trial, the following properties came under consideration: Reliable 24-hour efficacy in BP reduction following a single tablet daily taken in the morning (as confirmed by its high TPR), with exceptional hemodynamic tolerance, proven when initiated and maintained in all patient types (in heart failure, post MI, as well as in patients with a history of stroke). High tissue affinity. 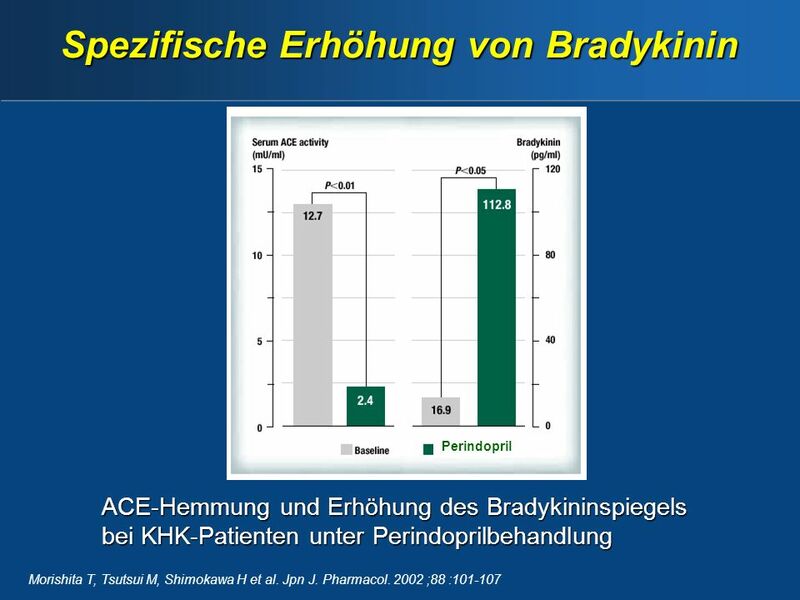 Unique increase of bradykinin. 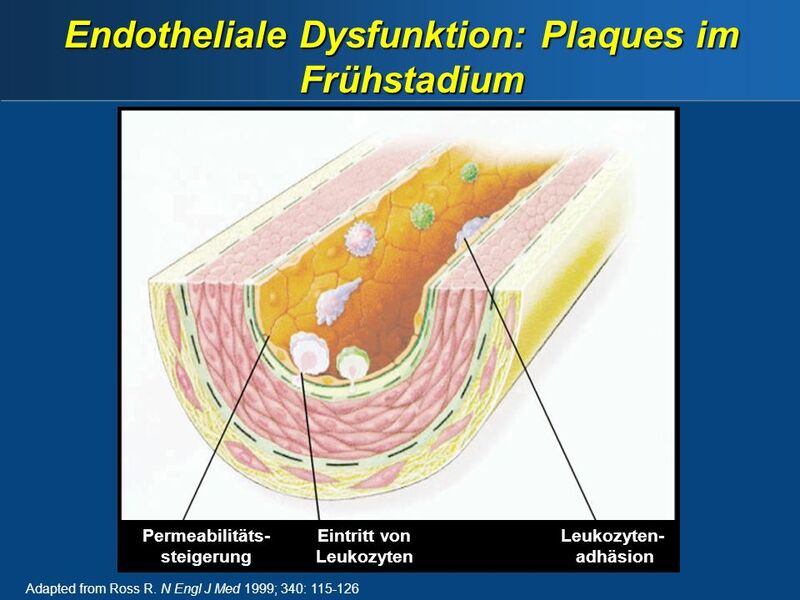 Its anti-ischemic properties proven to: - correct coronary endothelial dysfunction, - normalize the structure of resistance arteries, - normalize fibrinolitic balance and structure of resistance arteries Anti atherosclerotic effect Anti ischemic efficacy Good tolerance even in fragile patients with previous heart failure and strokes. 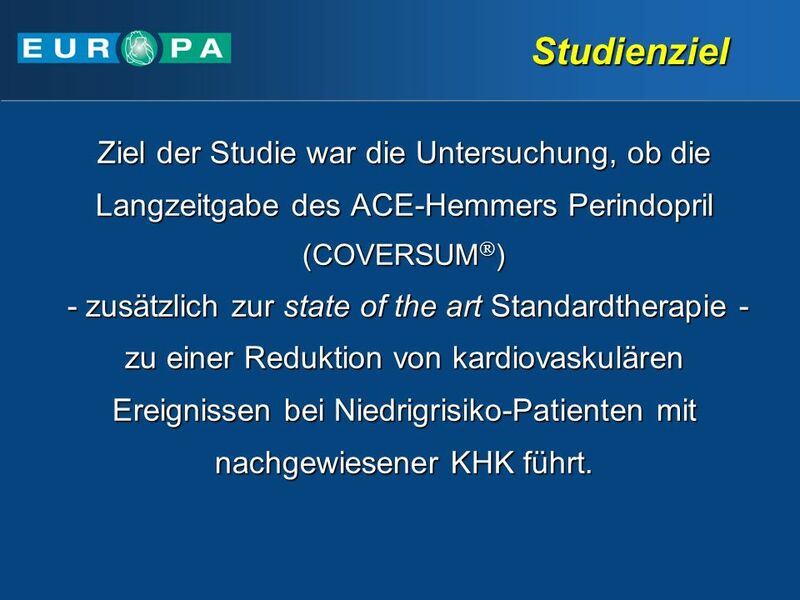 24 Studienziel Ziel der Studie war die Untersuchung, ob die Langzeitgabe des ACE-Hemmers Perindopril (COVERSUM) - zusätzlich zur state of the art Standardtherapie - zu einer Reduktion von kardiovaskulären Ereignissen bei Niedrigrisiko-Patienten mit nachgewiesener KHK führt. 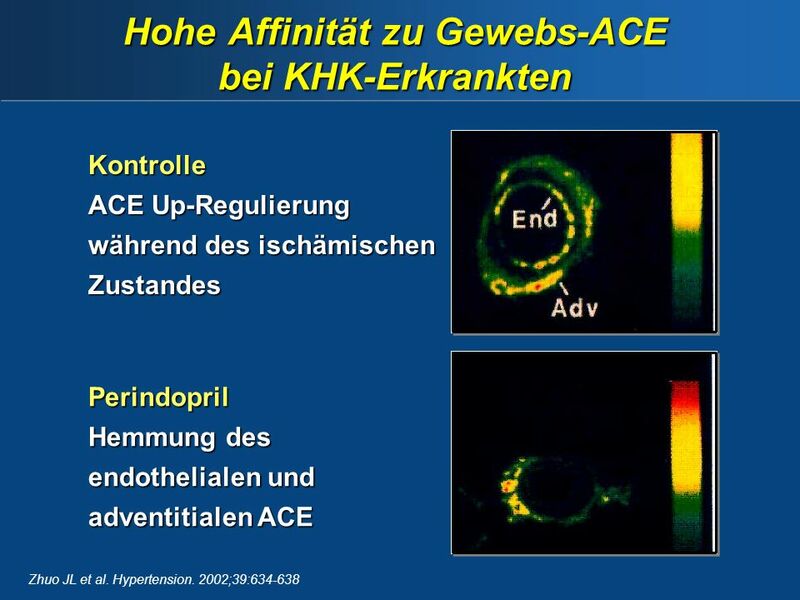 The aim of EUROPA is clear and simple: that is to examine and investigate whether long-term administration of the ACE inhibitor Perindopril added to standard therapy leads to secondary prevention of ischemic events in patients with documented coronary artery disease, with or without signs of myocardial ischemia, and without heart failure. 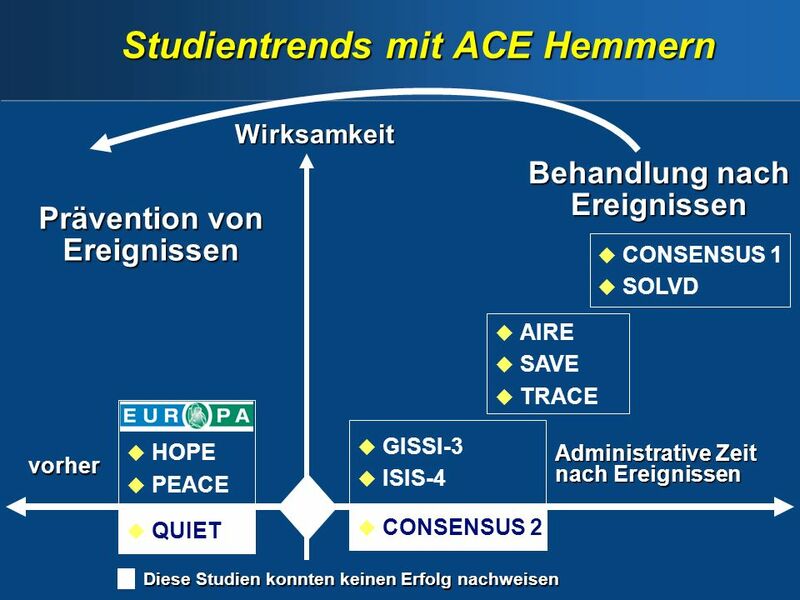 25 Studienendpunkte Primärer Endpunkt Sekundäre Endpunkte . CV Mortalität + nicht tödl. MI + Herzstillstand Gesamtmortalität + nicht tödl. 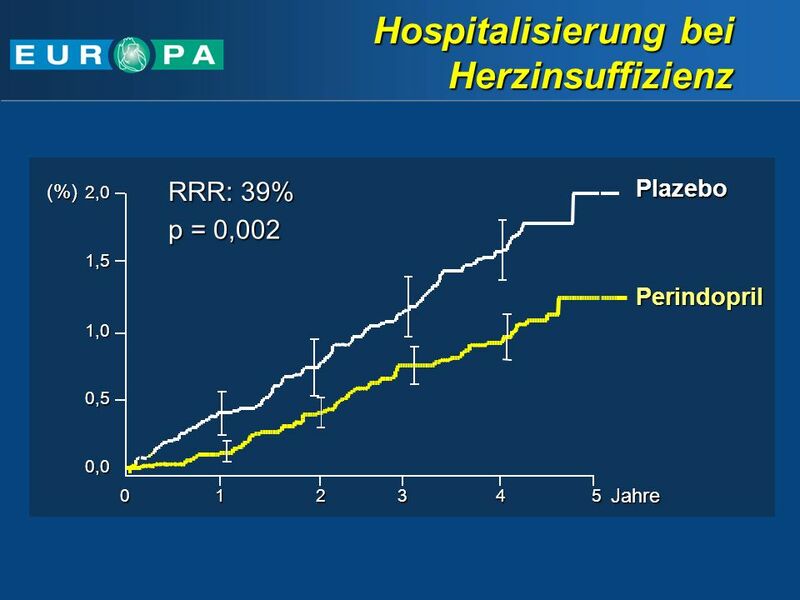 MI + Angina Pectoris + Herzstillstand Herzinsuffizienz Revaskularisierung (PCI/CABG) Schlaganfall Primärer Endpunkt Sekundäre Endpunkte The EUROPA study was designed to determine whether adding perindopril to optimal therapy decreased the rate of: CV mortality, non fatal MI, cardiac arrest – primary endpoint In addition, selected secondary end points of the study were: total mortality + non fatal MI + unstable angina + cardiac arrest; heart failure; revascularisation (PCI/CABG) and stroke. 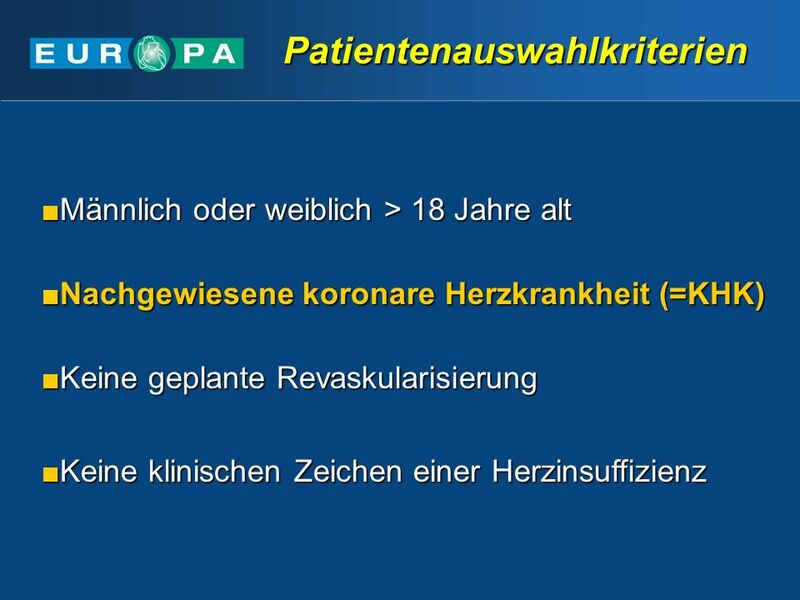 Männlich oder weiblich > 18 Jahre alt Nachgewiesene koronare Herzkrankheit (=KHK) Keine geplante Revaskularisierung Keine klinischen Zeichen einer Herzinsuffizienz According to these selection criteria, some important points can be highlighted: the patient profile is very close to the general population met in clinical practice in terms of age and risk factors. Patients include were older than 18 years, had documented coronary disease, were not scheduled for revascularisation and had no clinical signs of heart failure. 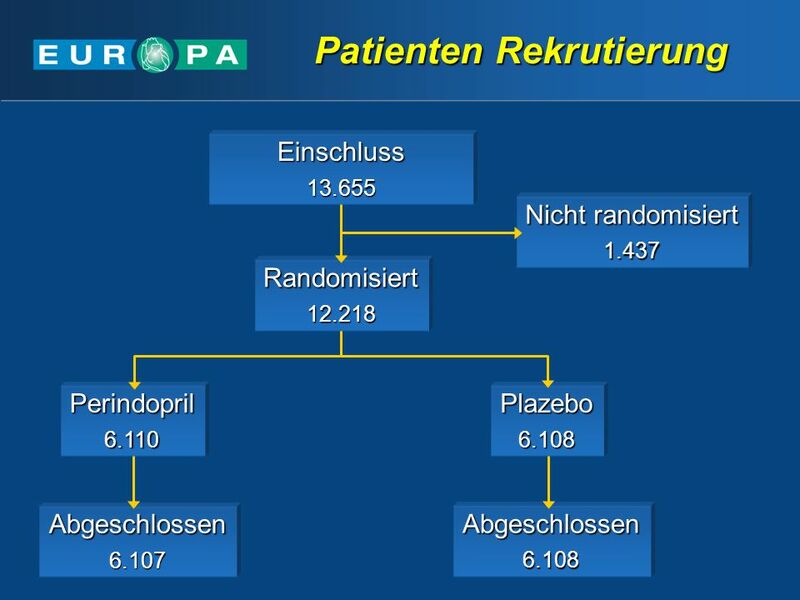 Abgeschlossen 6.107 6.108 Perindopril 6.110 Plazebo Randomisiert 12.218 Nicht randomisiert 1.437 Einschluss 13.655 Patients were followed up at 3, 6, and 12 months, and every 6 months thereafter. After randomisation, withdrawals from treatment were similar to those for placebo, and only 3 patients were lost to follow up amongst 12,218 patients. 31 424 Zentren: Patienten 102 176 141 130 57 1251 2176 115 94 300 399 285 511 890 17 22 2068 1772 277 134 209 65 197 830 EUROPA trail is a true pan-European trial. 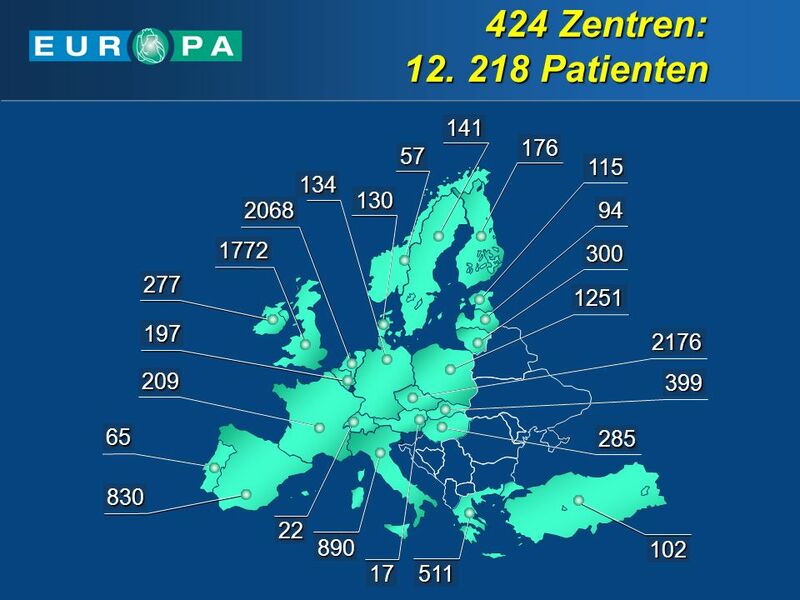 Therefore, the results were applicable across all Europe, including 12,218 patients that were randomised from 424 centers in 24 Europeen countries, involving 525 investigators. Unverträglichkeit Hypotonie Kreatinin/Kalium Erhöhung Schlechte Compliance Wichtige klin. Ereignisse Keine med. 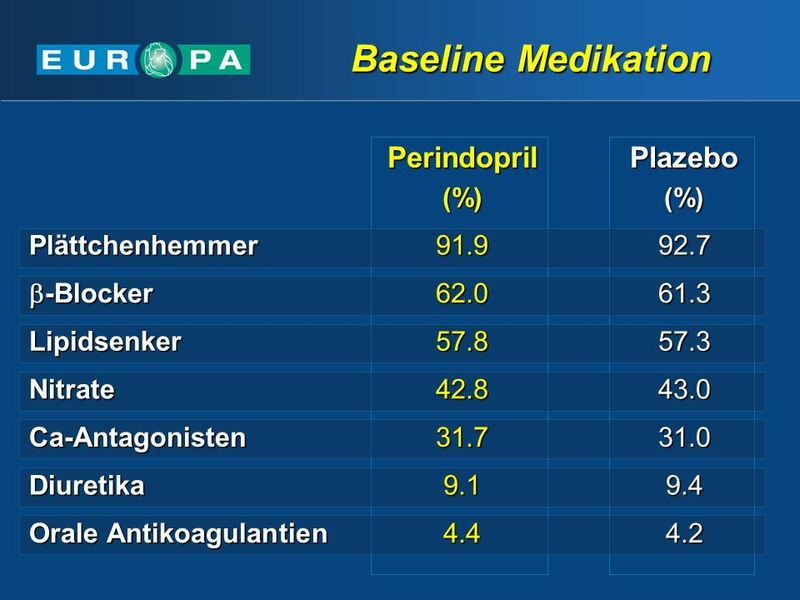 Gründe Unspezifisch 2.4 2.1 1.1 0.6 0.5 3.3 % Perindopril 8 mg once daily was well tolerated. Around 10% of patients were not randomised after the open-label dose-titration phase for various reasons. 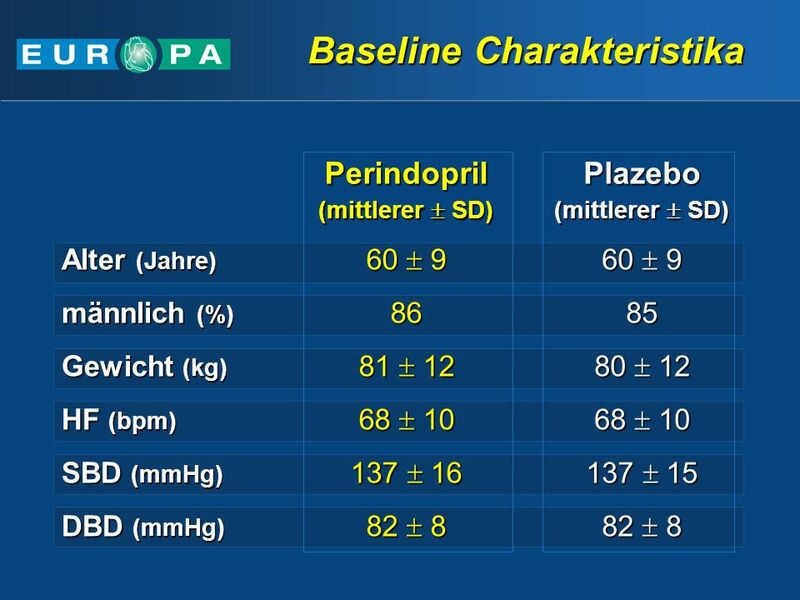 Perindopril (mittlerer  SD) Plazebo Alter (Jahre) 60  9 männlich (%) 86 85 Gewicht (kg) 81  12 80  12 HF (bpm) 68  10 SBD (mmHg) 137  16 137  15 DBD (mmHg) 82  8 The analysis of the baseline characteristics of patients recruited into the study showed that: Patients were at least 18 years without clinical evidence of heart failure and with evidence of coronary artery disease. 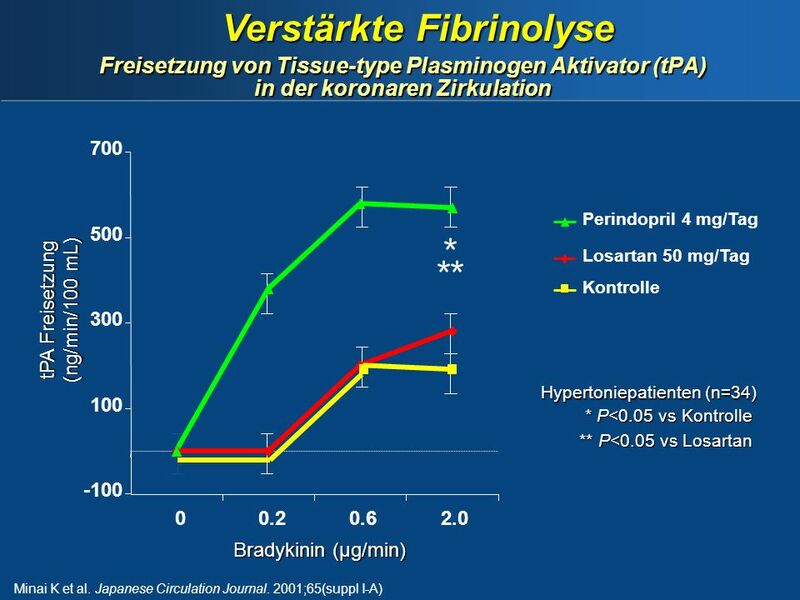 In average they were 60 years old which is not old for coronary artery disease. They were largely men: 86%, weight: 81+12, heart rate: and they had normal blood pressure. 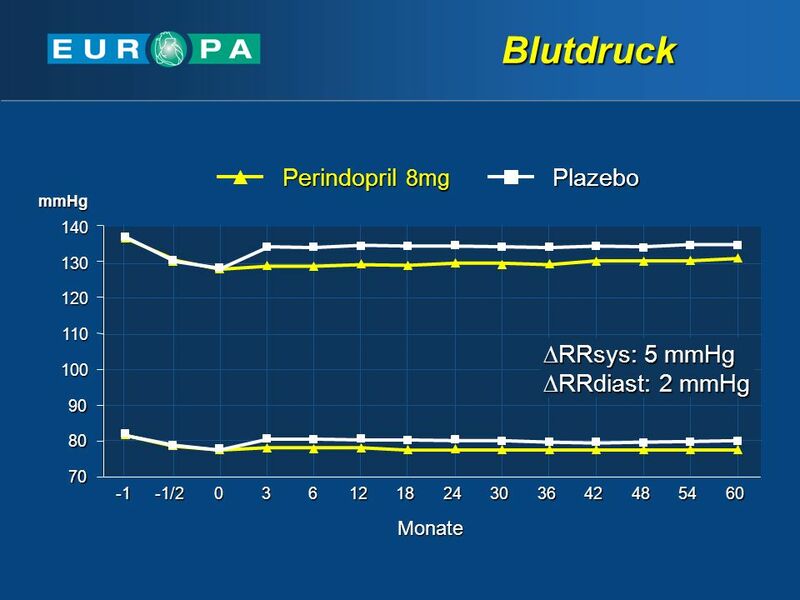 Importantly, there were no differences between these two groups, perindpril and placebo, almost identically matched. 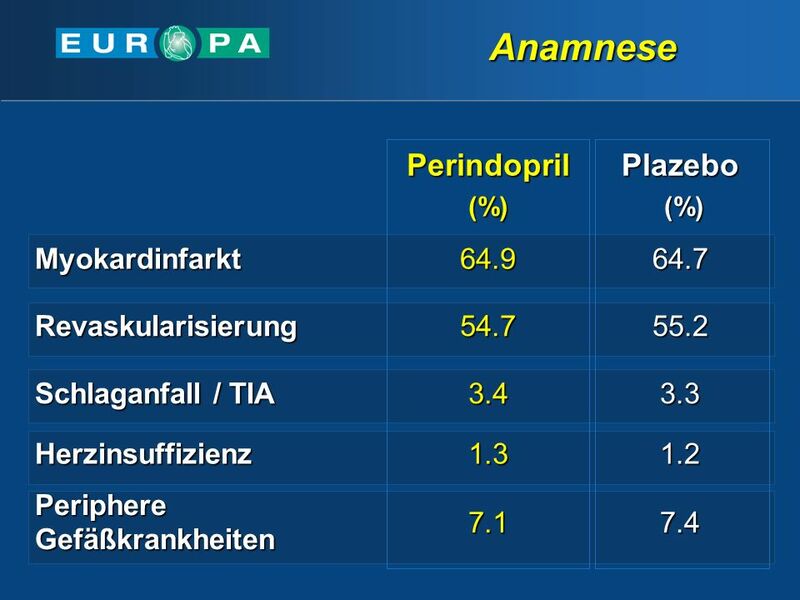 (%) Plazebo Myokardinfarkt 64.9 64.7 Revaskularisierung 54.7 55.2 Schlaganfall / TIA 3.4 3.3 Herzinsuffizienz 1.3 1.2 Periphere Gefäßkrankheiten 7.1 7.4 There were 65% of patients with previous history of MI, 83% of those with MI was more than 1 year in the past, 1/3 of them had an MI 5 years before study started. 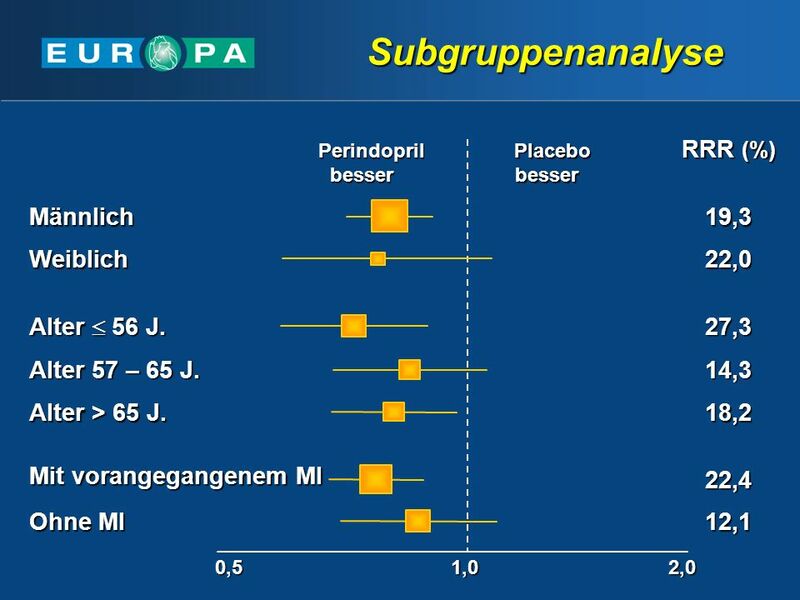 Half of the patients randomised had revascularisation, and small % of patients had peripheral vascular disease, history of stroke or TIA and 1.3 had heart failure as it was the exclusion criteria, all equally balanced between perindopril and placebo group. 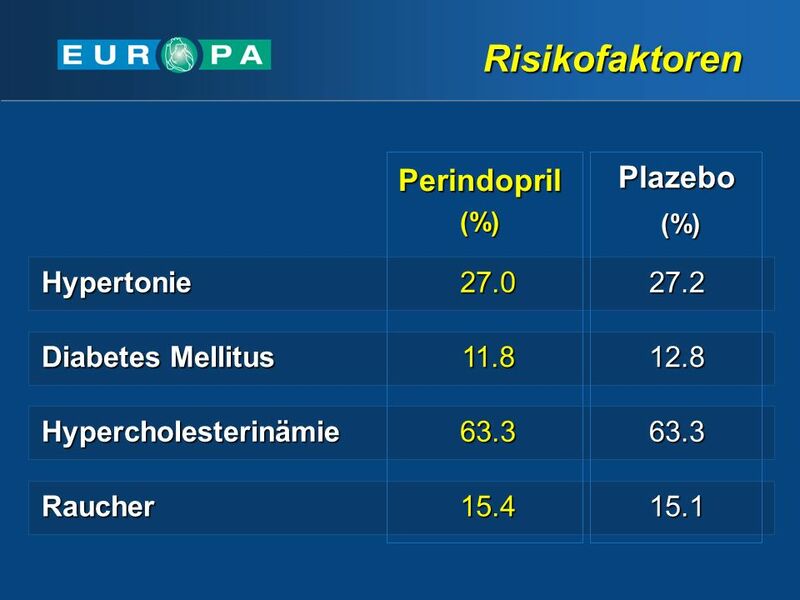 (%) Plazebo Hypertonie 27.0 27.2 Diabetes Mellitus 11.8 12.8 Hypercholesterinämie 63.3 Raucher 15.4 15.1 Patients randomised in EUROPA trial involved: hypertensive patients, which presented 27% of the study population, 11.8% of patients had diabetes, 63.3% were hypercholesterolemic and 15.4% declared themselves as smokers. 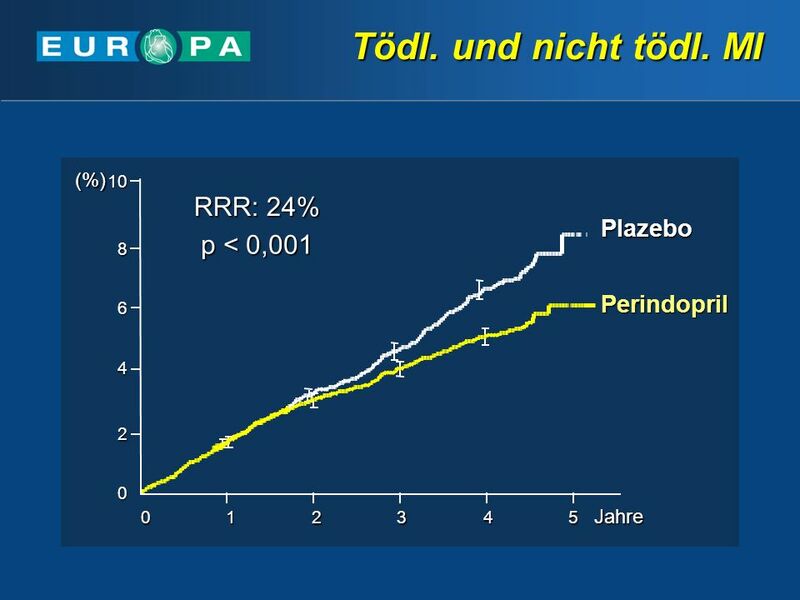 Again, a very balanced population was maintained between perindopril and placebo groups of patients. (%) Plazebo Plättchenhemmer 91.9 92.7 -Blocker 62.0 61.3 Lipidsenker 57.8 57.3 Nitrate 42.8 43.0 Ca-Antagonisten 31.7 31.0 Diuretika 9.1 9.4 Orale Antikoagulantien 4.4 4.2 Of particular importance when it comes to interpretation of this study is the background treatment. 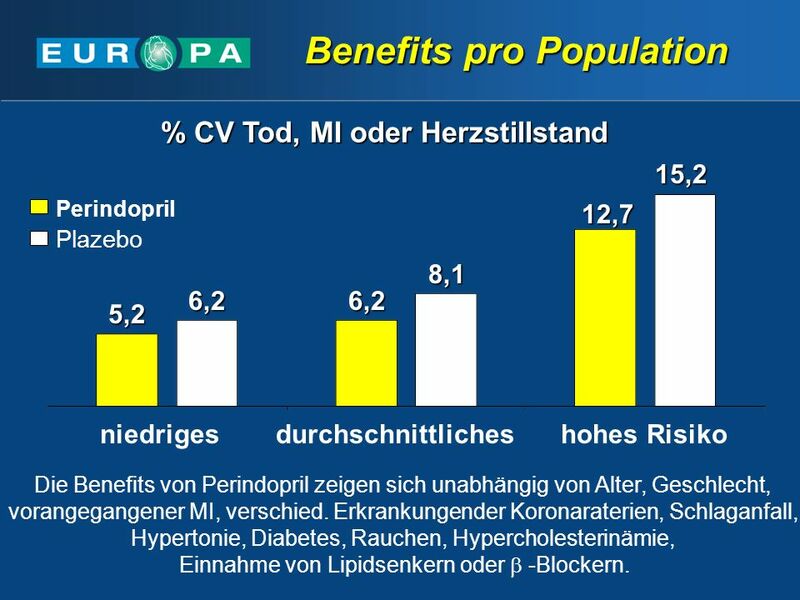 Demographic data clearly demonstrate that the EUROPA patients were receiving perindopril or placebo on top of optimal preventive therapy. Most of the randomised coronary artery disease patients were treated with platelet inhibitors, B-blockers, lipid lowering drugs, nitrates, Ca-blockers, diuretics and oral anticoagulants. Homogeneity was maintained between these two groups of patients. 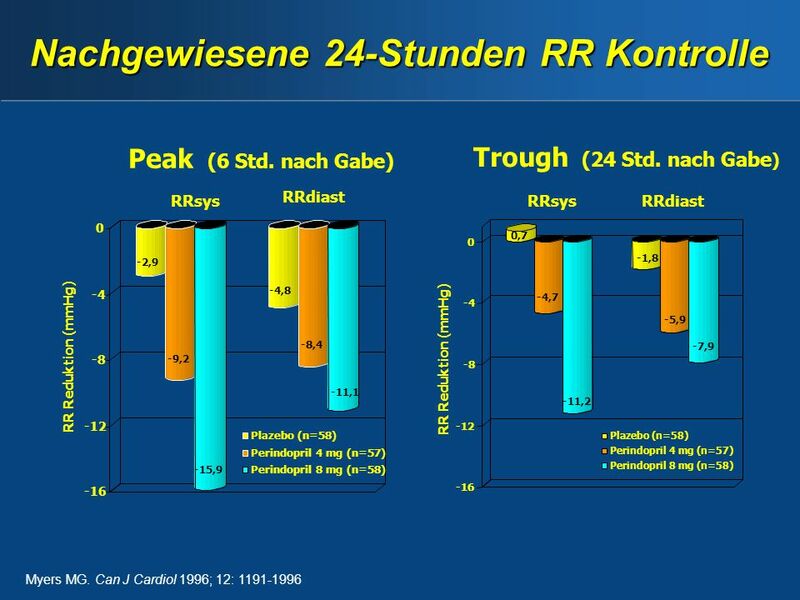 0,5 1,0 2,0 20 14 22 46 RRR (%) Perindopril besser Plazebo besser CV Mortalität, MI, Herzstillstand CV Mortalität Nicht tödlicher MI Herzstillstand Gesamtmortalität, MI, Instabile Angina pectoris, All components of the primary end point were reduced in favour of perindopril.CV mortality was reduced by 14%, non fatal MI by 22% and cardiac arrest by 46%. Composite of total mortality, non-fatal MI, unstable angina, cardiac arrest was significantly reduced by 14%. 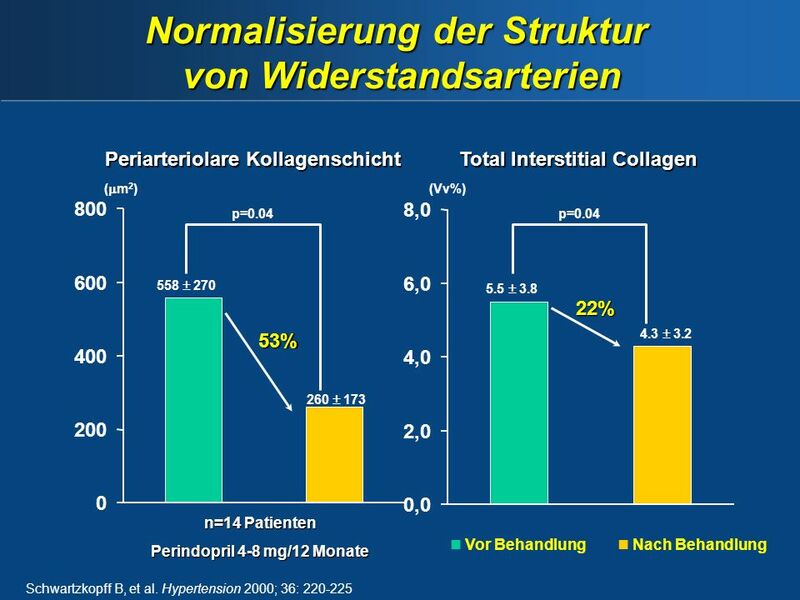 0,5 1,0 2,0 Perindopril besser Placebo Mit vorangegangenem MI Ohne MI 22,4 12,1 Alter  56 J. Alter 57 – 65 J. Alter > 65 J. 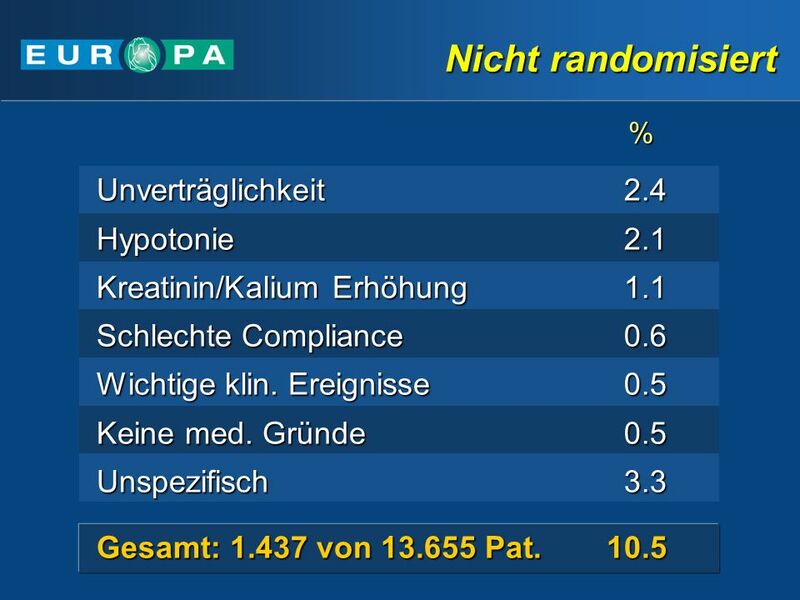 27,3 14,3 18,2 Männlich Weiblich 19,3 22,0 Sub-group analysis demonstrated that all patients benefited from perindopril 8 mg once daily. Regardless of gender, age or history of MI, the cardiovascular death, MI or cardiac arrest was always in favor of perindopril group. 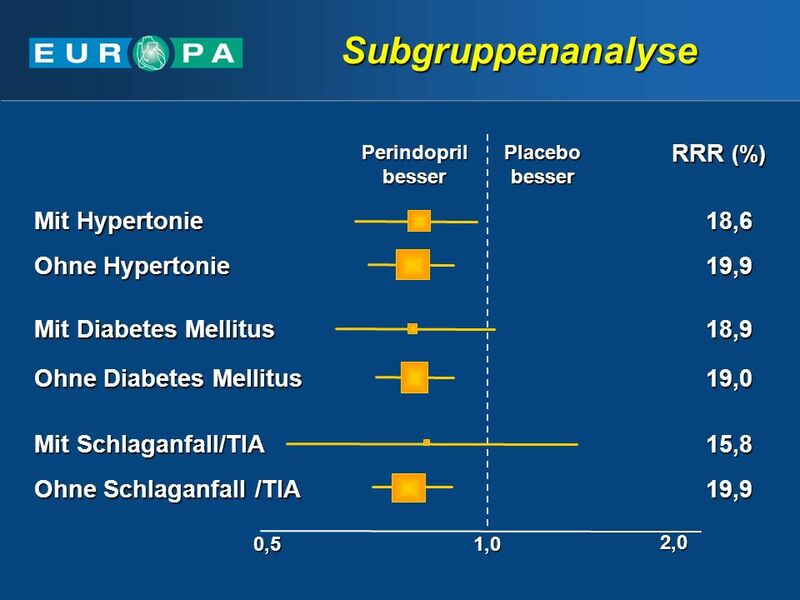 0,5 1,0 2,0 Mit Hypertonie RRR (%) Perindopril besser Placebo besser Ohne Hypertonie Mit Diabetes Mellitus Ohne Diabetes Mellitus Mit Schlaganfall/TIA Ohne Schlaganfall /TIA 18,6 19,9 18,9 19,0 15,8 Sub-group analysis, also, showed that perindopril 8 mg once daily reduced morbidity and mortality in all patients irrespective of previous history of hypertension, diabetes or stroke and/or TIA. 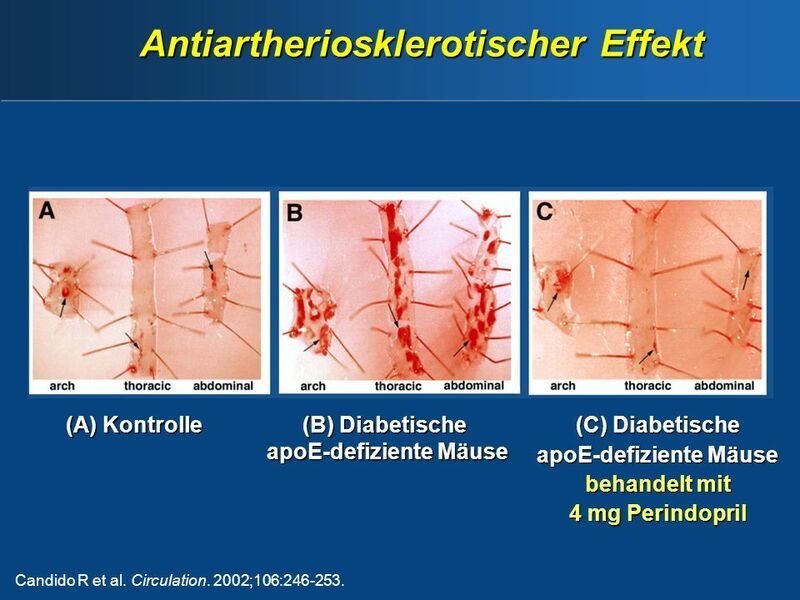 0,5 1,0 2,0 Perindopril besser Placebo besser Gesamtmort., MI, inst. 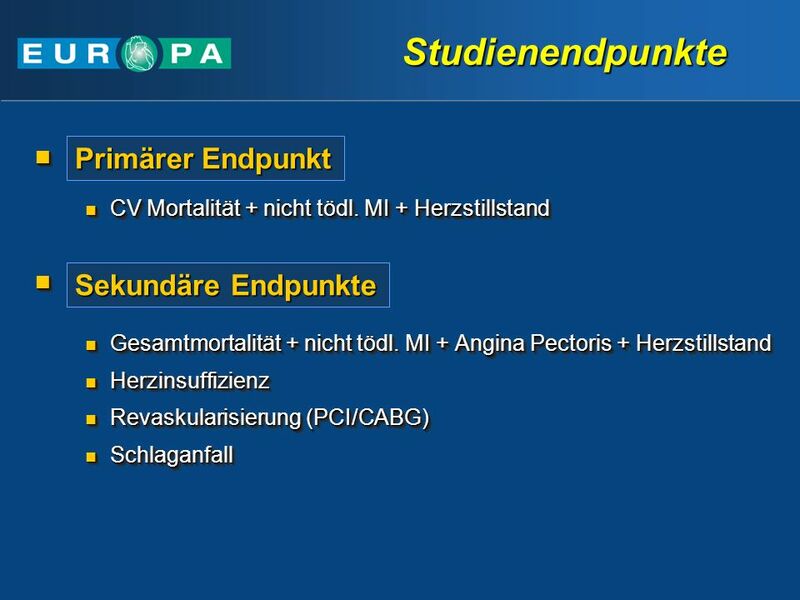 Angine p.,Herzstillstand CV Mortalität & MI CV Mortalität , MI & Schlaganfall CV Mortalität , MI, Revaskularisation CV Mortalität , MI, Angina pectoris Tödl. & nicht tödl. 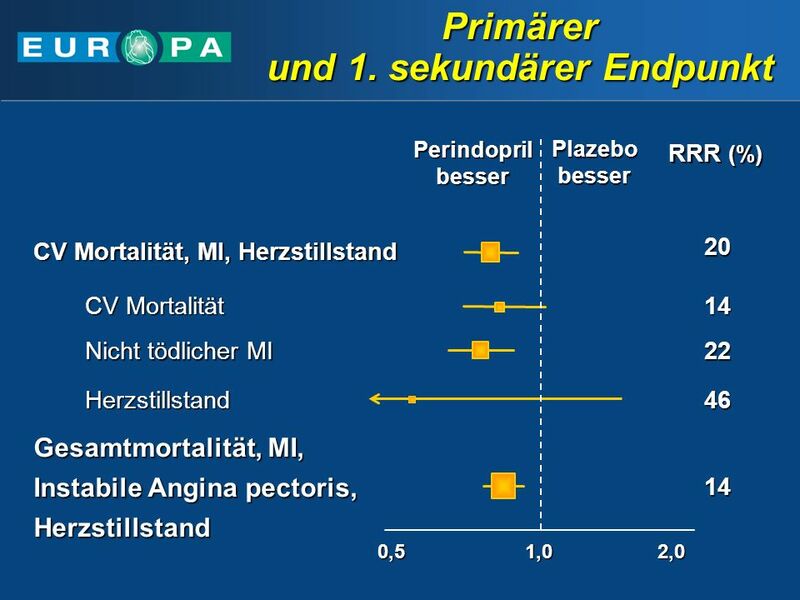 MI Gesamtmortalität CV Mortalität Angina pectoris Herzstillstand Schlaganfall Revaskularisierung Herzinsuffizienz RRR (%) 14,0 19,3 17,4 11,3 15,5 16,5 23,9 11,0 13,9 7,1 45,6 4,3 4,2 39,2 Beneficial effect of treatment with perindopril on all prespecified secondary endpoints was shown in EUROPA. -1 -1/2 3 6 12 18 24 30 36 42 48 54 60 Monate 70 80 90 100 110 120 130 140 mmHg RRsys: 5 mmHg RRdiast: 2 mmHg During the run-in period during where all patients received perindopril, blood pressure was reduced from 137/82 to 128/78 mm Hg. 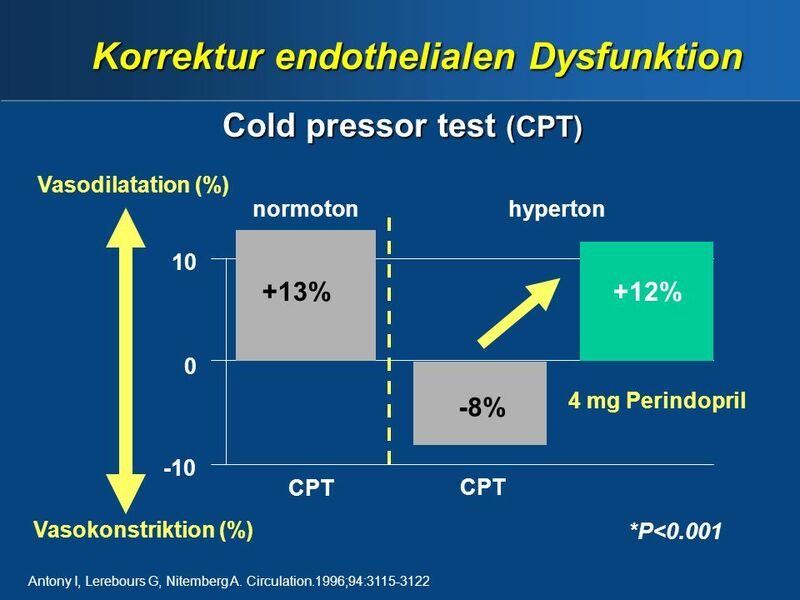 After randomisation, systolic and diastolic blood pressures among patients treated with perindopril were maintained until the study end and the average blood pressure during double-blind treatment was 5/2 mm Hg higher in the placebo group. 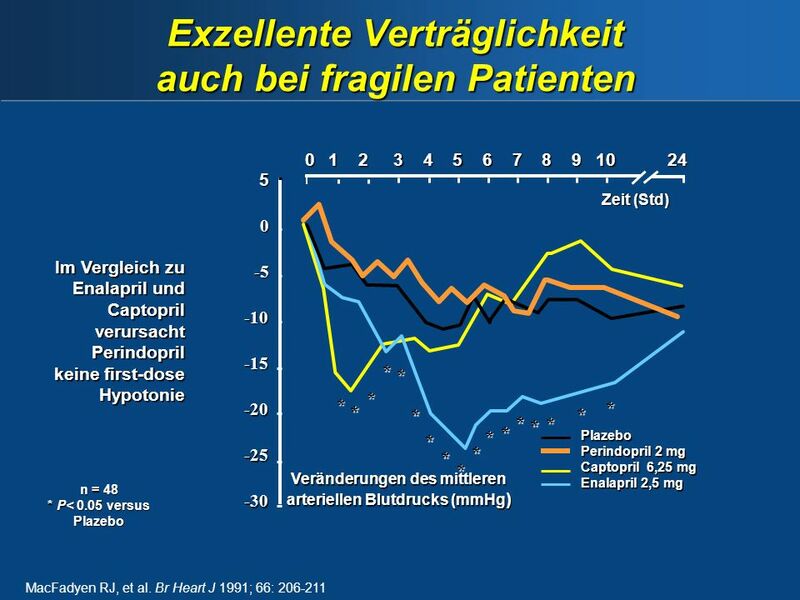 Also, it was shown that reduction of fatal and non-fatal MI was reduced more then due to the reduction of BP alone (ref. EUROPA editorial). 6 12 18 24 30 36 Monate 20 40 60 80 100 120 (%) Plazebo Perindopril 8mg After randomisation, study medication was well tolerated. At 3 years, 81% of patients assigned perindopril and 84% of placebo patients, were taking study medication. 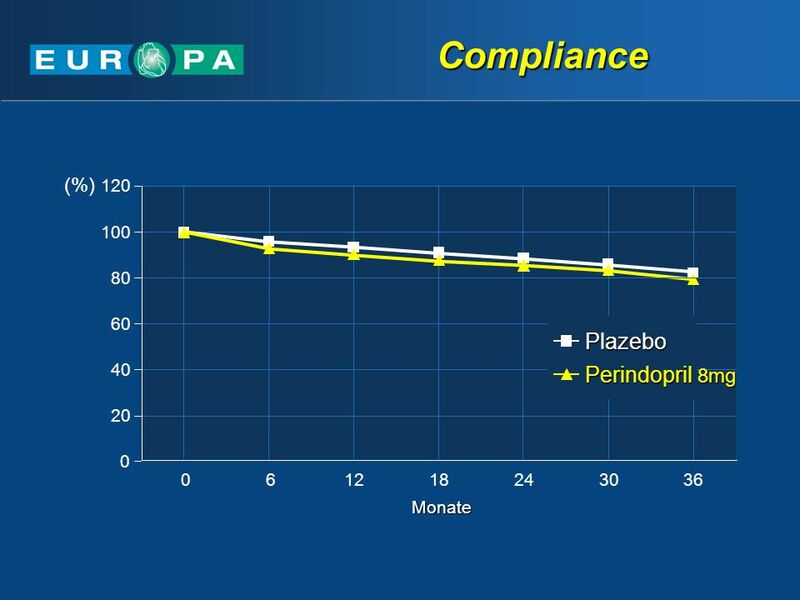 Most of the patients assigned to perindopril continued on 8 mg, only 7% had dropped to 4 mg at 3 years. The average use of study medication was 3.7 years of 4.2 years follow-up. Perindopril % Plazebo Husten 2.7 0.5 Hypotonie 1.0 0.3 Niereninsuffizienz Unverträglichkeit 2.4 1.3 Studienendpunkt 6.2 7.5 Hypertonie 0.4 0.8 Verweigerung der Einnahme 4.3 4.2 Sonstige Gründe 5.7 5.8 As perindopril 8 mg once daily was very well tolerated, the reasons for permanent withdrawal from treatment were comparable to placebo. 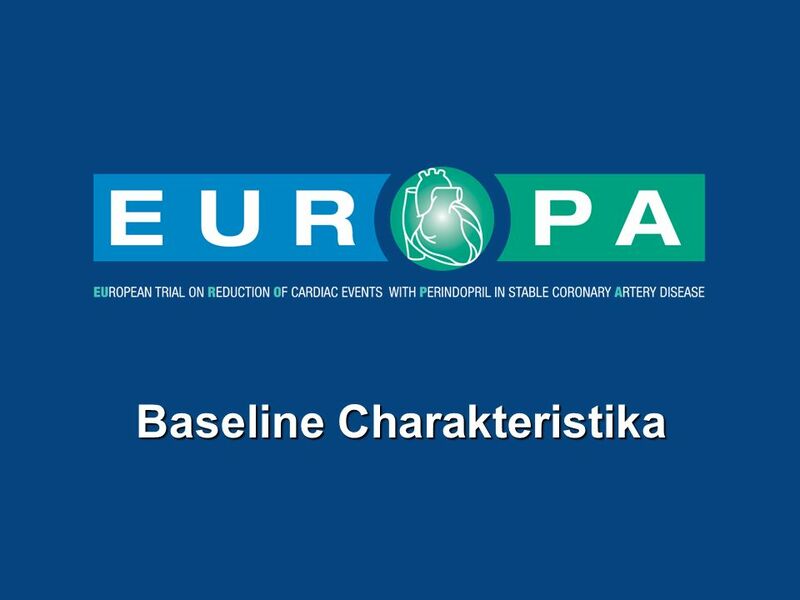 Clinical implications from EUROPA trial are important for all at-risk coronary artery disease patients in the clinical practice. 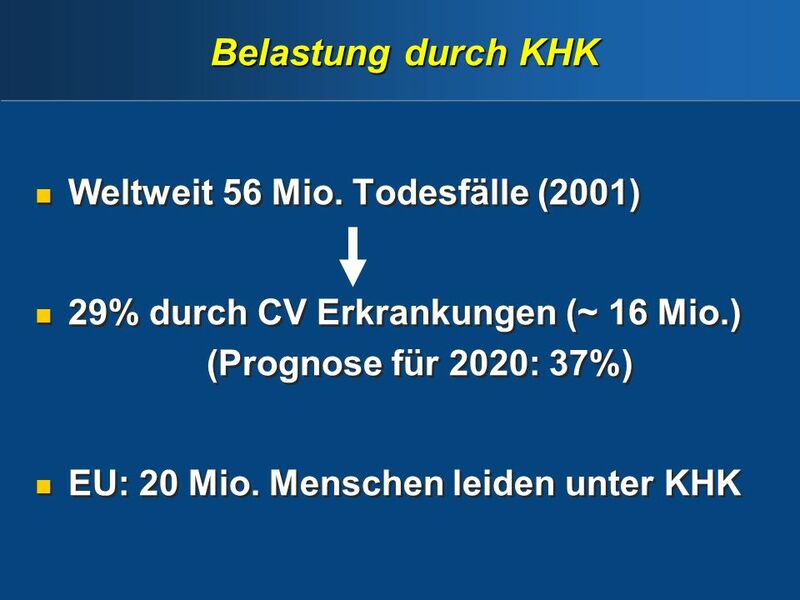 29% durch CV Erkrankungen (~ 16 Mio.) (Prognose für 2020: 37%) EU: 20 Mio. 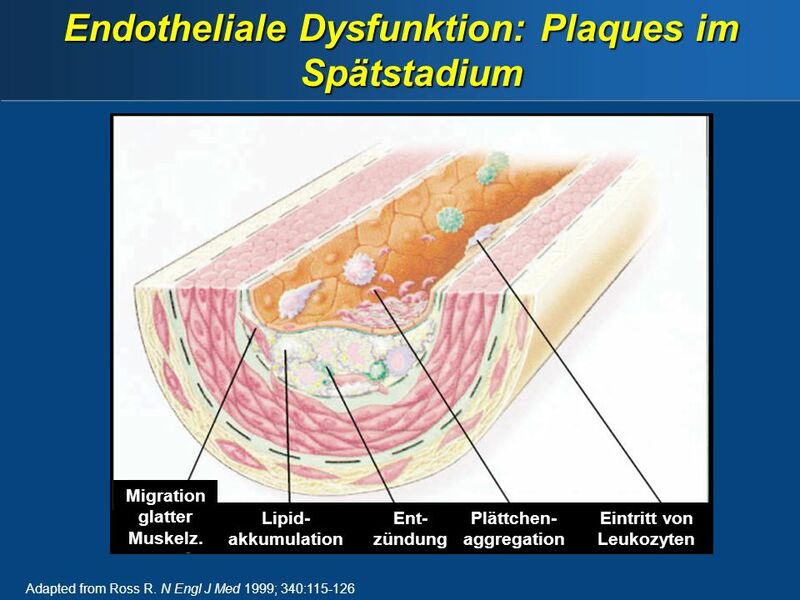 Menschen leiden unter KHK Out of 56 million deaths worldwide in 2001, burden of coronary disease is accounted for 29% of them, causing deaths in total for 16 million people. In 2020, 37% of deaths are foreseen as CV deaths. In the European Union, there are 20 million people at risk who have coronary artery disease. Prof. Kim Fox, at the EUROPA study presentation commented that “investigators were particularly excited because the disease they are talking about is the most important disease, and every improvement they can make will have a great impact on the health care in the western world. 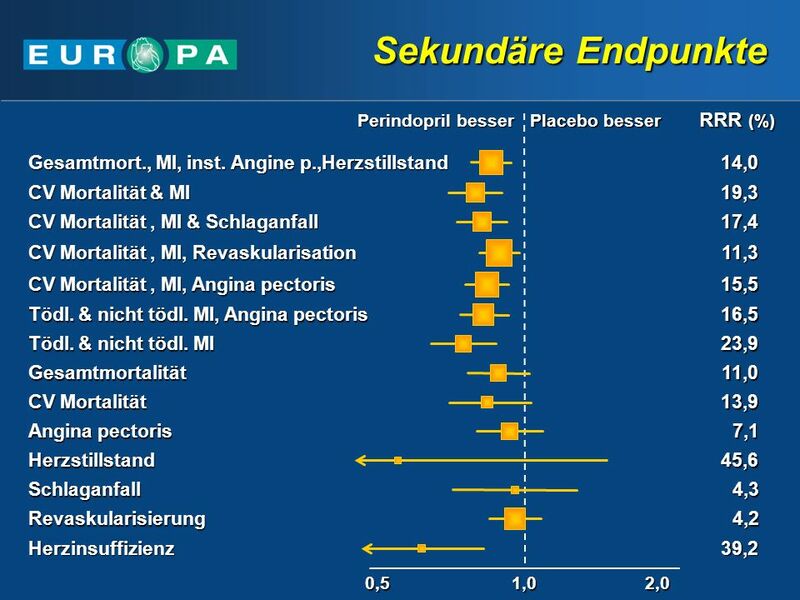 % CV Tod, MI oder Herzstillstand 15,2 Perindopril Plazebo 12,7 8,1 6,2 6,2 5,2 niedriges In EUROPA study, all at-risk patients benefited, whether they were in low, medium or high risk group of patients. 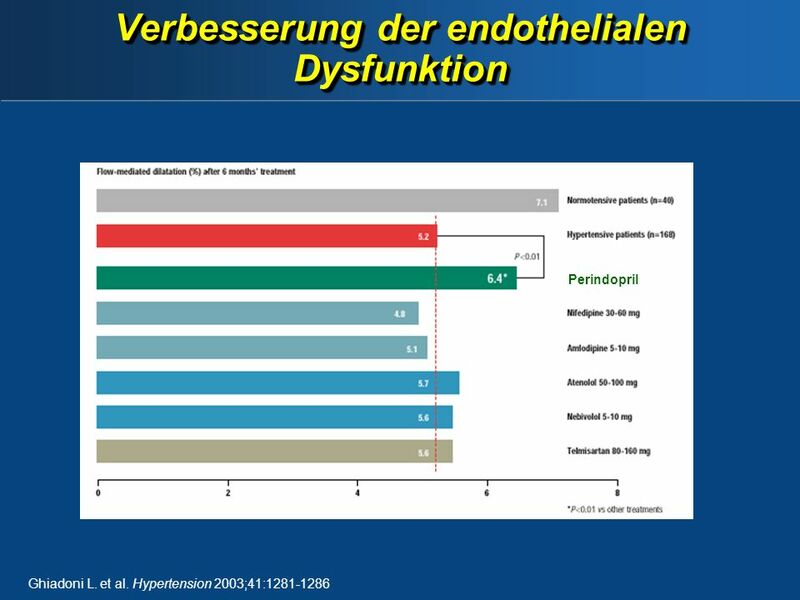 Perindopril 8 mg once daily reduced primary end-point (CV death, MI or cardiac arrest) regardless of age, gender, previous history of coronary artery disease (MI, CABG/PTCA, PVD, stroke), risk factors (smoking, diabetes) or preventive therapy (platelet inhibitors, lipid lowering drugs or B-blockers). 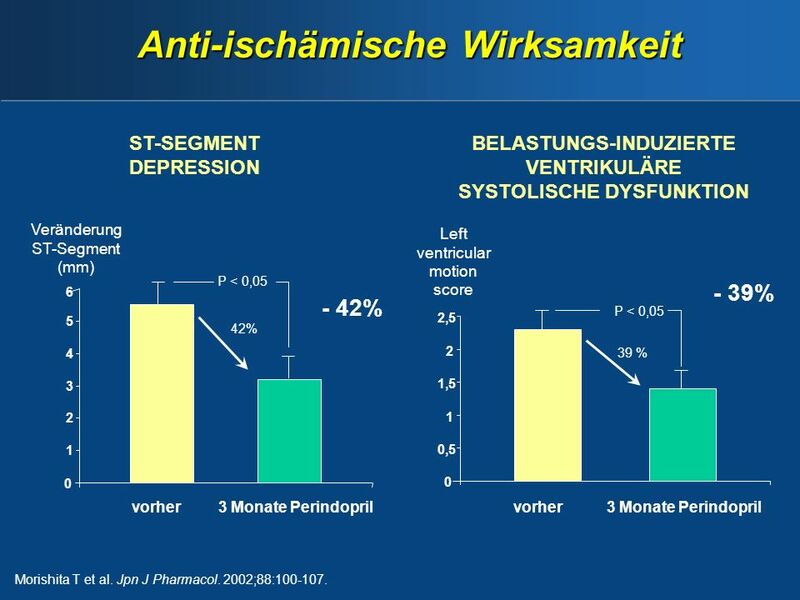 durchschnittliches hohes Risiko Die Benefits von Perindopril zeigen sich unabhängig von Alter, Geschlecht, vorangegangener MI, verschied. 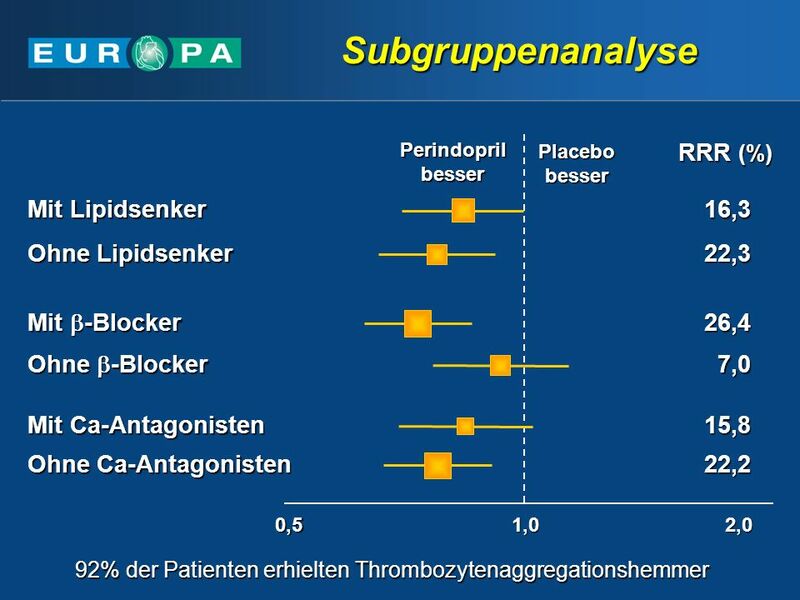 Erkrankungender Koronaraterien, Schlaganfall, Hypertonie, Diabetes, Rauchen, Hypercholesterinämie, Einnahme von Lipidsenkern oder  -Blockern. 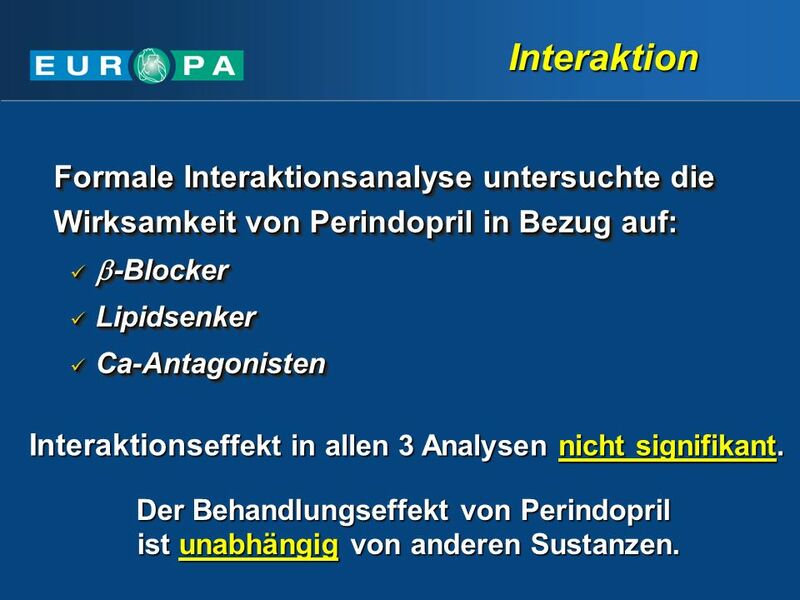 53 Interaktion Formale Interaktionsanalyse untersuchte die Wirksamkeit von Perindopril in Bezug auf: -Blocker Lipidsenker Ca-Antagonisten Interaktionseffekt in allen 3 Analysen nicht signifikant. Although patients were treated with perindopril 8 mg once daily on top of standard, preventive therapy, there were no significant interactions reported between the perindopril and all background medications. 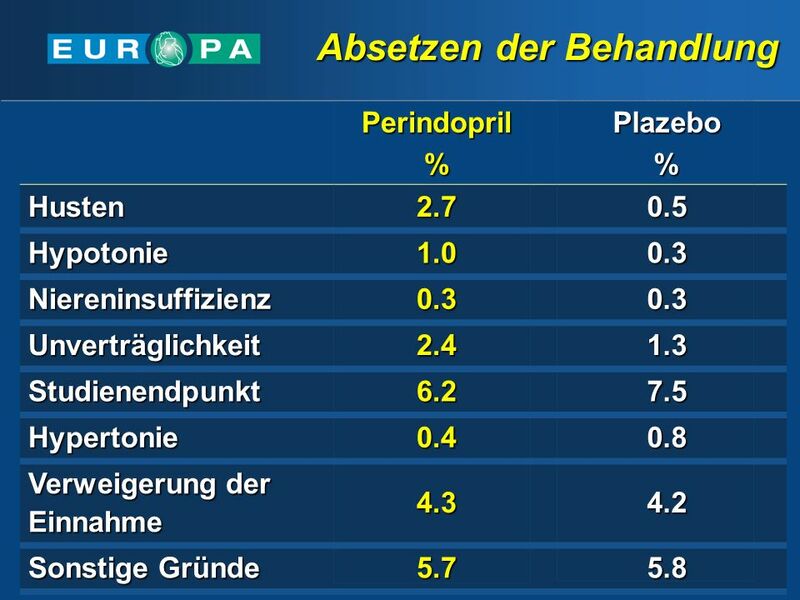 Der Behandlungseffekt von Perindopril ist unabhängig von anderen Sustanzen. 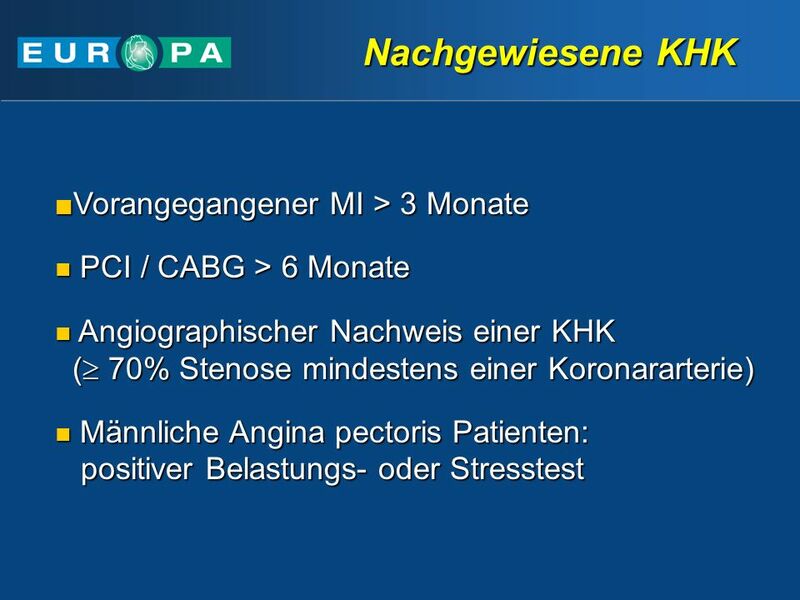 Weiblich (%) 27 15 Dokumetierte KHK (%) 80 100 Vorangegangener MI (%) 53 65 Periph. Gefäßerkr. 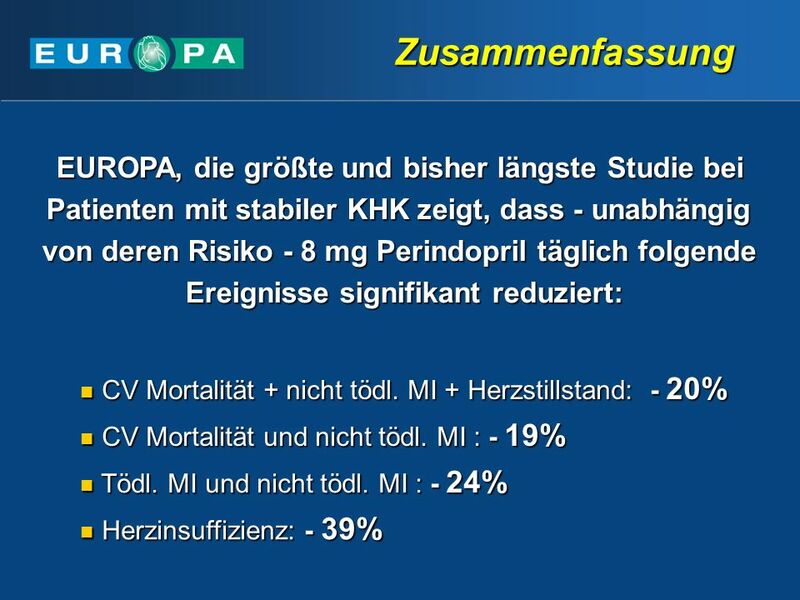 (%) 43 7 Schlaganfall / TIA (%) 11 3 Diabetes (%) 38 12 Hypertonie (%) 47 Hypercholesterinämie (%) 63 EUROPA study with perindopril 8 mg once daily extends the observations of HOPE, in which cardiovascular events were reduced with ACE inhibition in high-risk patients with coronary heart disease. 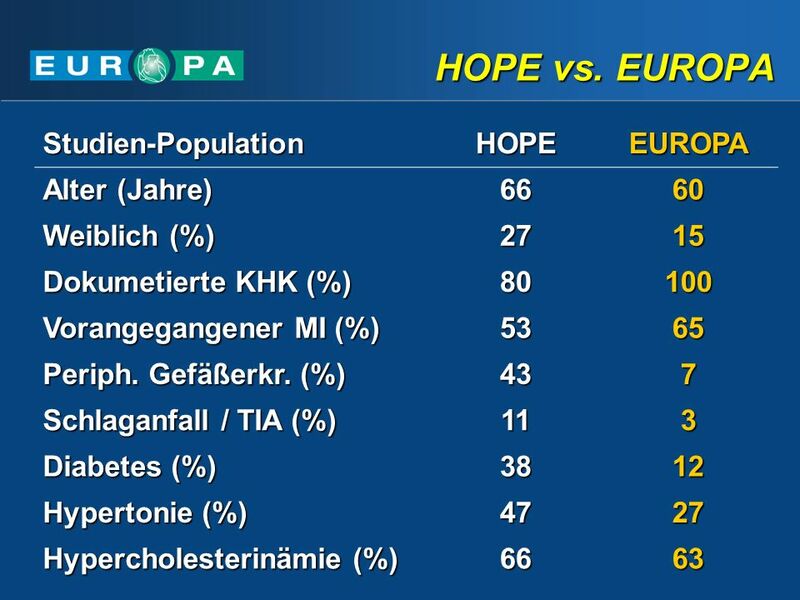 The risk of patients in EUROPA was lower than in HOPE, which selected older patients (66 vs 60), who had higher percentage of cardiovascular risk disease PVD, hypertension), stroke or diabetes. 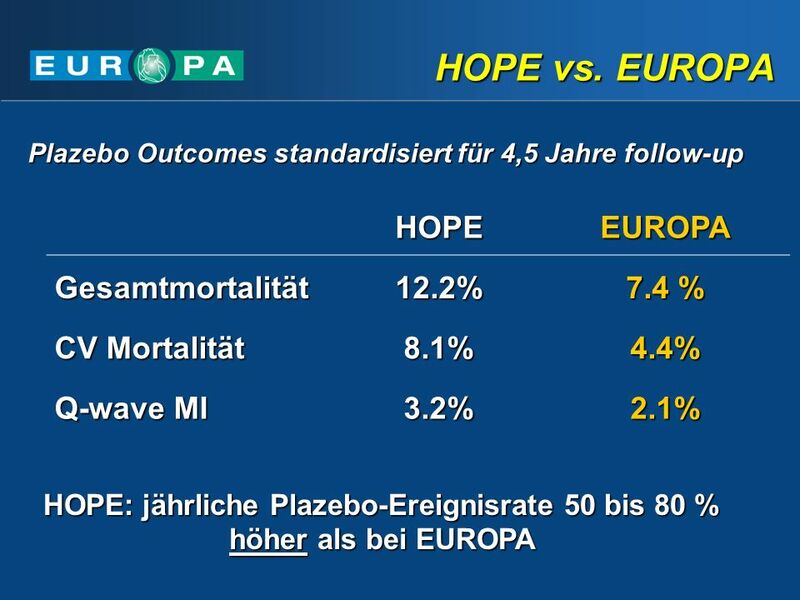 HOPE vs. EUROPA Plazebo Outcomes standardisiert für 4,5 Jahre follow-up HOPE EUROPA Gesamtmortalität 12.2% 7.4 % CV Mortalität 8.1% 4.4% Q-wave MI 3.2% 2.1% HOPE: jährliche Plazebo-Ereignisrate 50 bis 80 % höher als bei EUROPA At a mean follow-up of 4.5 years, HOPE reported a placebo mortality of 12%, cardiovascular mortality of 8%, and Q-wave myocardial infarction of 3%, compared with 7%, 4%, and 2%, respectively, in EUROPA study at 4.2 years of follow-up. 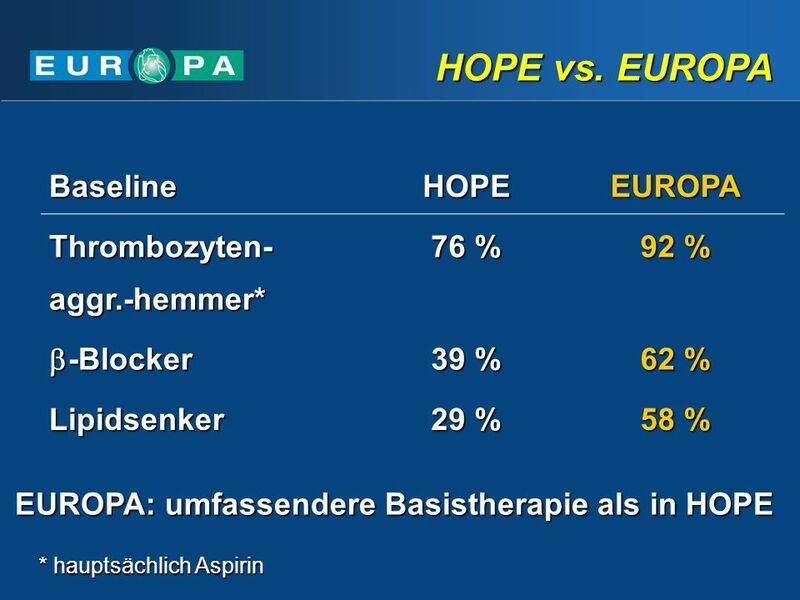 Thus, the major annual event rates in HOPE were 40% to 80% higher than those in EUROPA. 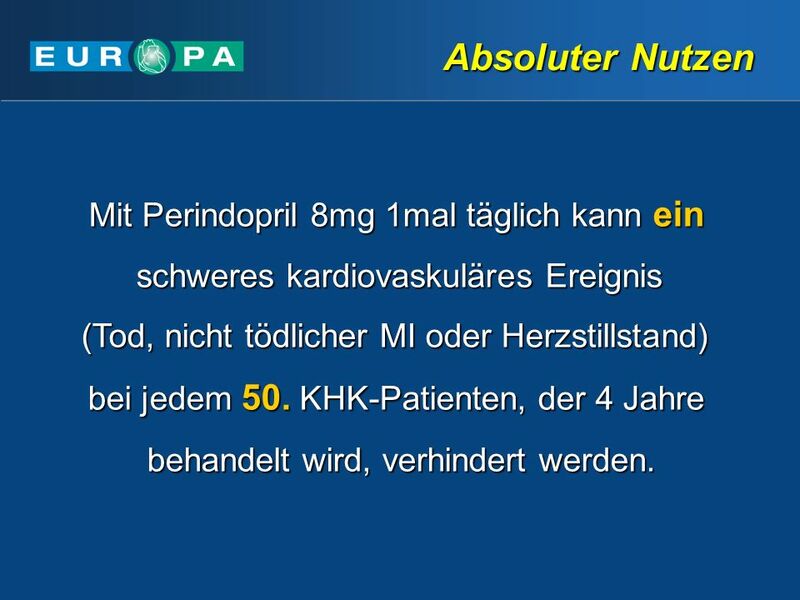 59 Absoluter Nutzen Mit Perindopril 8mg 1mal täglich kann ein schweres kardiovaskuläres Ereignis (Tod, nicht tödlicher MI oder Herzstillstand) bei jedem 50. 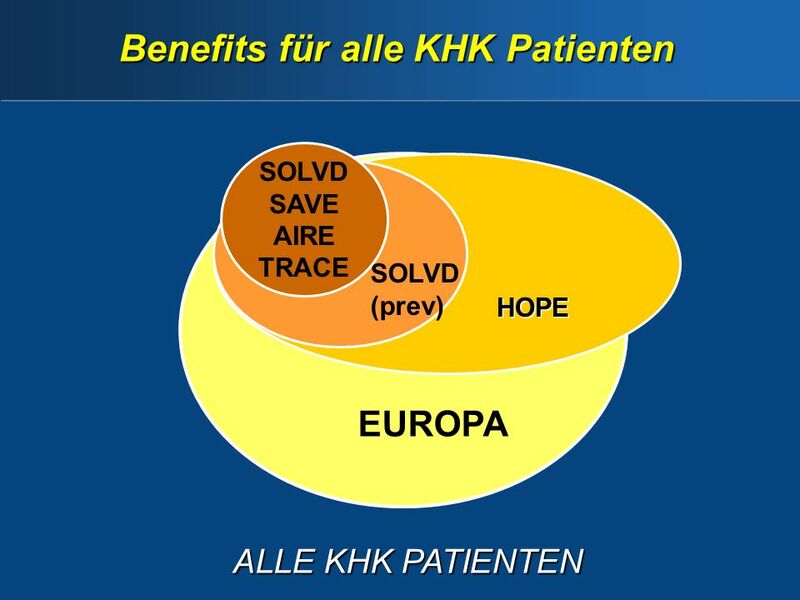 KHK-Patienten, der 4 Jahre behandelt wird, verhindert werden. 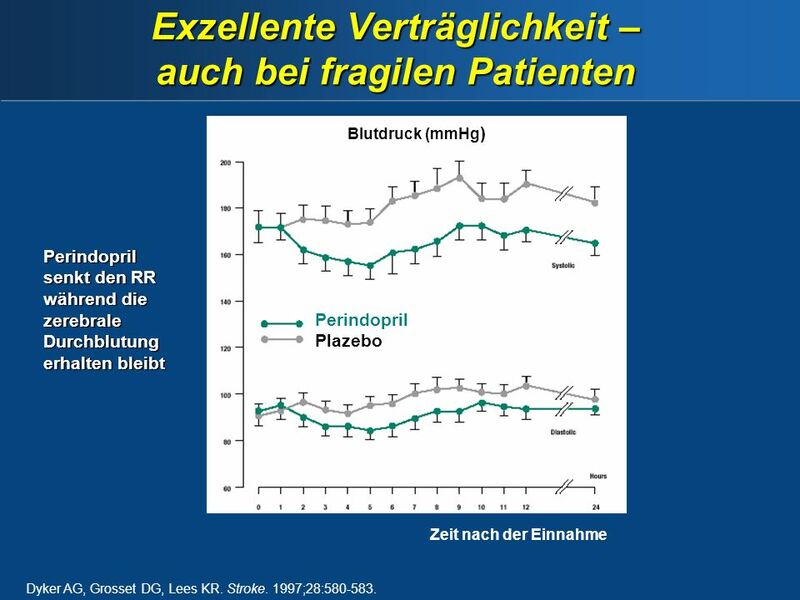 Once again, the absolute benefits were achieved with perindopril 8 mg once daily in the EUROPA trial: “Adding perindopril to standard optimal therapy over a four year period would stop 50,000 heart attacks or cardiovascular deaths in a country with a population of 60 million” concluded prof. Kim Fox, the study chairman. 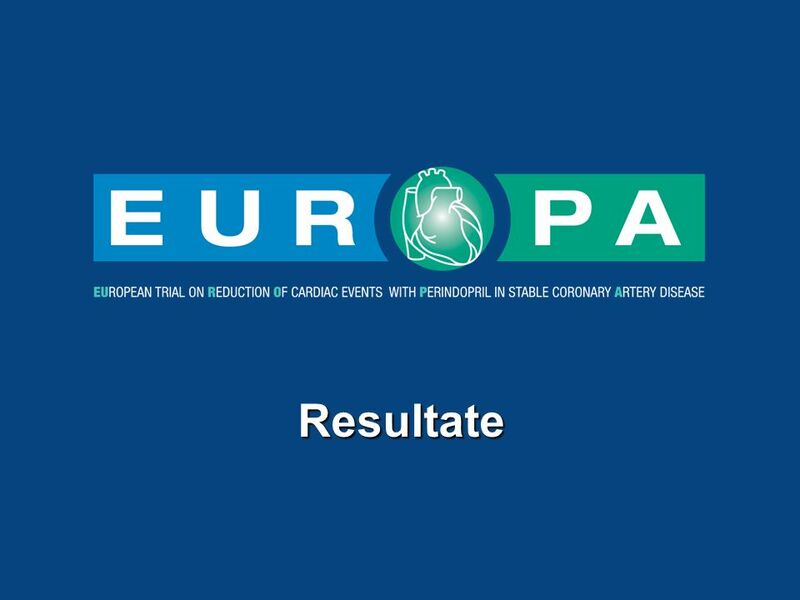 “The EUROPA trial provides clear evidence of major health gains for these patients. If the findings are applied worldwide then many millions of lives could be saved” added prof. Willem Remme, the study chairman. 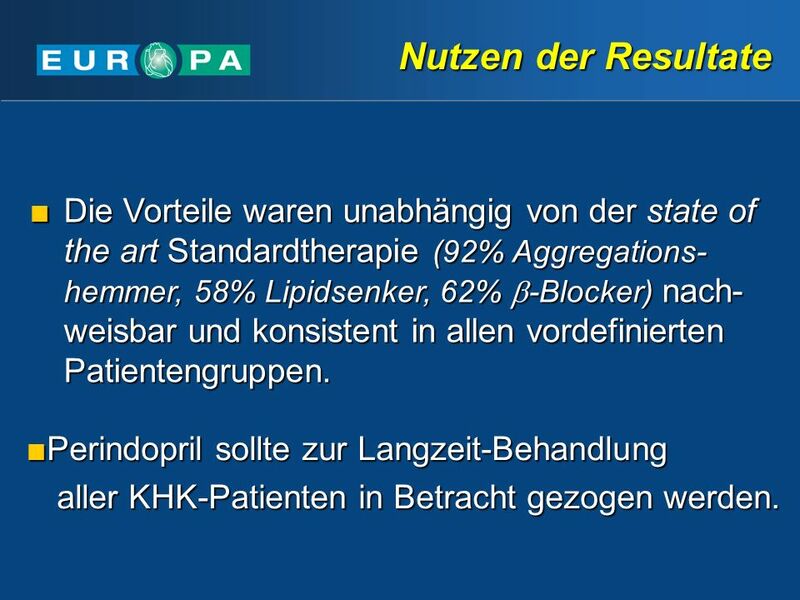 60 Nutzen der Resultate Die Vorteile waren unabhängig von der state of the art Standardtherapie (92% Aggregations- hemmer, 58% Lipidsenker, 62% -Blocker) nach- weisbar und konsistent in allen vordefinierten Patientengruppen. 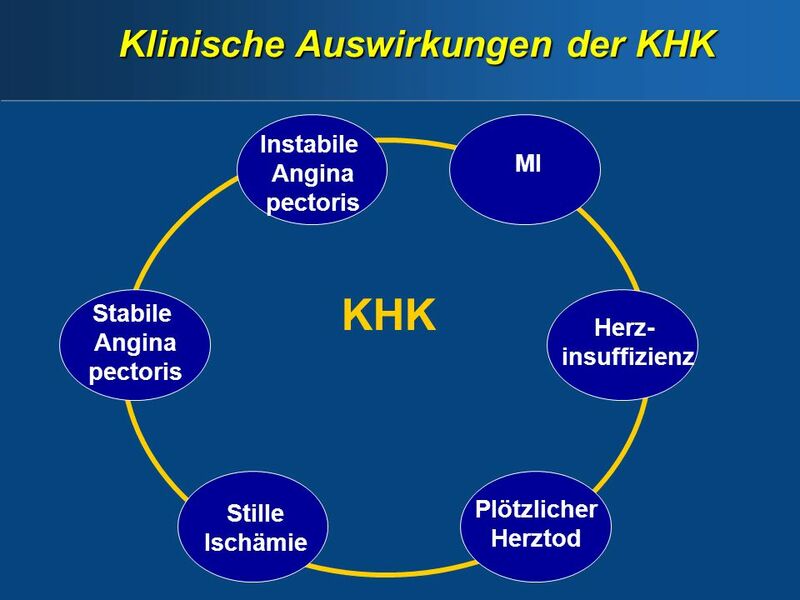 Perindopril sollte zur Langzeit-Behandlung aller KHK-Patienten in Betracht gezogen werden. 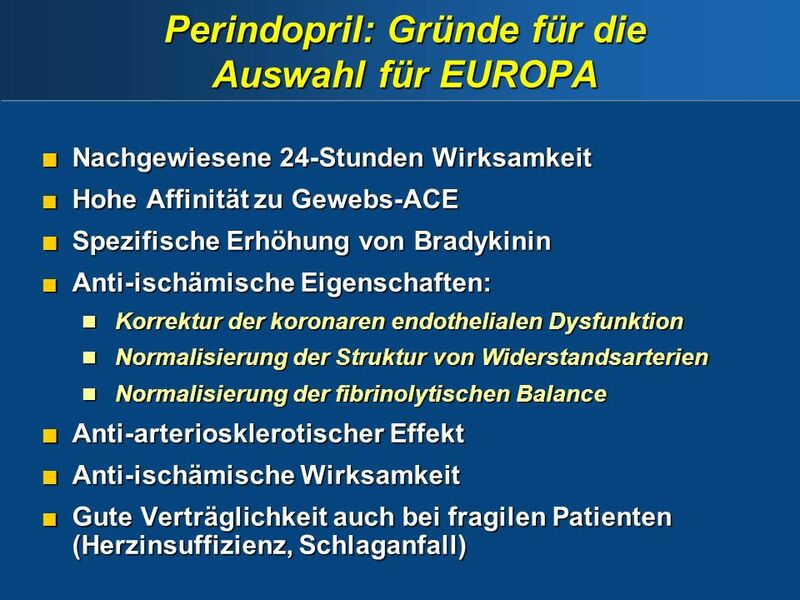 Last but not least, all these benefits demonstrated with perindopril 8 mg once daily in EUROPA trial, were achieved on top of standard optimal treatment (platelet inhibitors, lipid lowering drugs and ß -blockers) and are consistent in all sub-groups of patients. 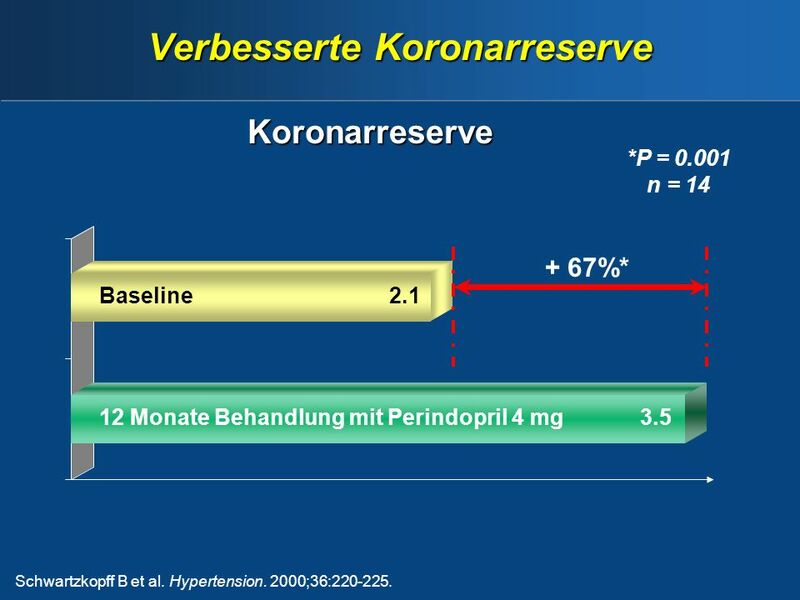 Perindopril should be used in chronic therapy in all patients with coronary disease: As prof. Willem Remme concluded: “We now have sufficient evidence to show that perindopril, due to its anti-atherogenic effects and blood pressure lowering properties is beneficial and should be used in treating all patients with coronary artery disease”. 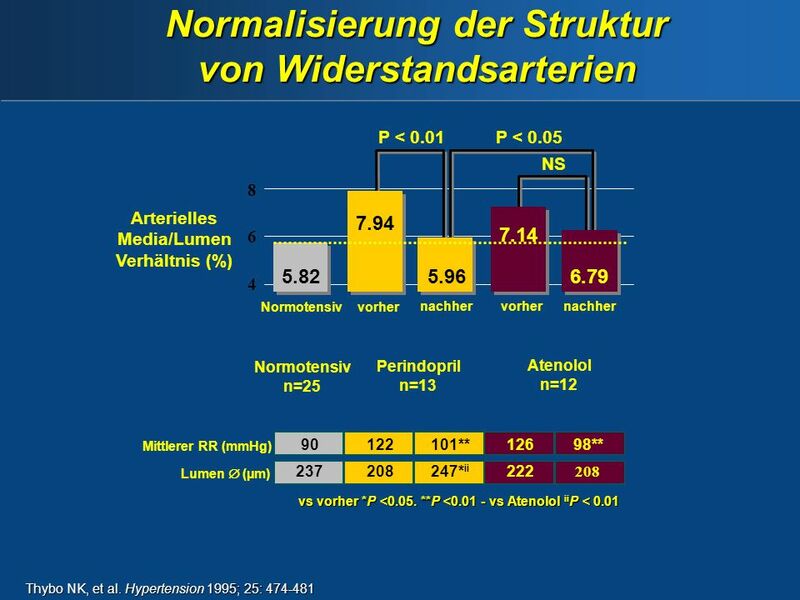 Herunterladen ppt "EUROPA (EUropean trial on Reduction Of cardiac events with Perindopril in stable Artery coronary disease) is the largest and longest study ever conducted."